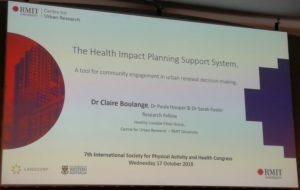 Back from the 7th International Society for Physical Activity and Health Congress in London (http://www.ispah.org/london-2018), this is a quick report on my experience of this conference. A little background for those of you who are not familiar with ISPAH (just like me before my first participation this year), this is a large conference on physical activity and health gathering academics, scholars, public health practitioners, policy makers and all people facing the challenge of reducing physical inactivity and the obesity epidemic. This year, the event gathered more than 1100 participants representing more than 60 countries. The conference kicked off with great talks from Dr. Charlie Foster, current president of ISPAH, Steve Brine, parliamentary secretary for public health, Duncan Selbie Chief executive of Public Health England and Dr. Fiona Bull, program manager on Prevention of noncommunicable Diseases at WHO, who remembered us why we were there, with striking messages: “Physical inactivity is responsible of 1 in 6 UK death, which is equal to smoking” (D.S. ), or some kind reminders emphasizing the nonsense of our actions when it comes to physical activity: people in the UK spend twice more time on the toilet bowl than doing physical activity… and I would doubt Luxembourg is doing better! I was involved in two talks, one as a presenter and one as a co-author. 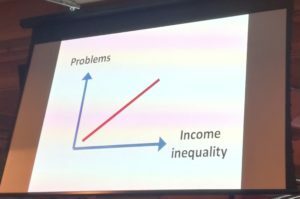 The talk format was a 5-minute presentation followed by a 3-minutes questions, which may appear very short (especially while preparing your slides), but forces you to give the core message of your study and to leave the rest for informal talks with your peers… Not bad! So the first talk looked at the influence of exposure to multiple environments, trips purposes and distance on utilitarian walking among older adults, based on the CURHA project (soon to be described on this blog). One of the main results stressed the varying barrier effect of distance on walking by trip purpose. People would be more likely to walk with increasing distance to discretionary activity vs. mandatory ones, as they might be more likely to performed these activities in optimal conditions (good weather, good perceived health, having the time to walk…) and thus, discretionary activities are characterized by a higher flexibility in space and time. The second talk, presented by Pr. Jean-Michel Oppert, examined the differential associations of walking and cycling with obesity markers based on the ACTI-Cités project. The related paper was published earlier this year in Obesity Facts (https://doi.org/10.1159/000488532). I attended mostly sessions looking at the spatial and environmental determinants of physical activity, intervention on physical activity and measurement of physical activity using new technologies. Among these sessions, I would like to report on a couple of talks that especially caught my attention. The first one was a session on “Air pollution and physical activity”, chaired by Dr. Fiona Bull, who immediately brought back the societal and public health issues at stakes: what to answer when the WHO’s phone rings with India on the line to consult on whether they should maintain or not the marathon given the high levels of air pollution? This session mainly addressed whether exposure to air pollution (while doing sport or physical activity) may modify the positive effect of physical activity on health? The answer was pretty clear: long terms benefits of PA among adults are not erased nor reversed by air pollution, so keep being active! On the top of that, Audrey de Nazelle gave a very informative talk on the exposure to air pollution by transport modes. While individuals spend approximatively 6% of their time in travel, it contributes to 24% of NO² inhalation! However, we should keep in mind that in Europe, pedestrians are the least exposed to air pollution compared to car, bus, and bicycle. And pedestrians might be more flexible than other transport mode to choose their travel path towards roads less saturated by car traffic and therefore less polluted. 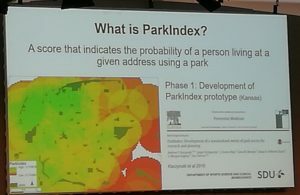 In a session on impact of places and spaces on physical activity, Dr. Jasper Schipperijn presented a ParkIndex tool to measure the exposure to park and predict the probability of an individual at a specific location to use a park. While in their validation study distance did not seem to predict park use, it confirmed me that the influence of “selective daily mobility” on health behaviors cannot be overlooked and should definitively get more attention by the scientific community. Finally, innovative tool to visualize exposure to build environment, simulate changes in the urban environment (i.e. school implementation in a neighborhood), and assess related effects on a large number of health related indicators was presented by Dr. Claire Boulange. 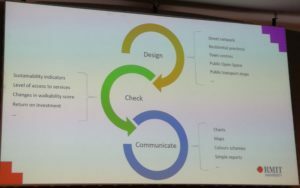 The power of communication with stakeholders of such a tool is obvious, and appears as a promising complementary method to assess the relevance of urban planning interventions. While a lot of other sessions were highly stimulating, I would like to end this report with the very inspiring talk from Richard Wilkinson “Mind the gap: health inequalities”, who made an irrevocable judgement to the case of social inequalities in physical activity and health, and urged each and every individual present at the conference to tackle the structural causes of physical inactivity, starting with socio-economic inequalities.